About baby Jesus. His mother Mary. Joseph. Angels. Shepherds. Wise men. The star. The Donkey. The Cow. The Camel. in the church where I was pastor years ago. These Christmas poems for children bring back many special memories. One of my favorite memories, as a teacher and pastor, was setting up the Nativity Scene, the one pictured above, in church with the children a few days before Christmas - sometimes the Sunday before Christmas. Before placing the images in the nativity scene, I would ask the children what each of the figures said. And they would give the answer. And wherever I went during the season, I would ask children and families this question. What did these 10 say? What did the angel over the stable say? What did Mary say? and Joseph? and the shepherds? and the wise men? and the sheep, the cow, the donkey, and the camel? And the child? Almost nobody ever got the last one right. The first poem I wrote below gives the answer. This manger is also very special to me. Several months before Christmas - in the mid-1990's - some big boxes arrived. These figures were an amazing gift sent to our church by a community in Quebec, Canada, who hand-made and hand-painted them. 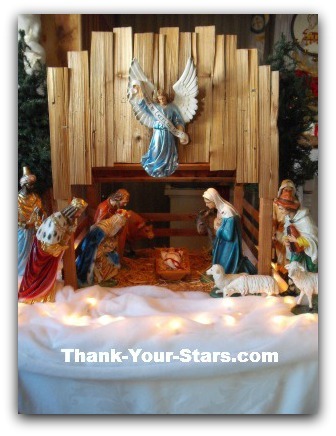 Several weeks before Christmas, I spent 3 days making the stable, mostly from scraps in a pile of stove firewood. It was near miraculous. I haven't done anything quite like it before or since. In January 2012, I traveled over 1000 miles each way to the church where I had been pastor, to take photos of this Nativity Scene. I had been wanting to post them on this website for some years. The camel makes a rumbling growl. To shepherds the joyful story. In the highest heaven, Glory! In manger, the child born this day. Then told others, to God gave praise. The will of God for all is done. Wise men make the journey searching. Saying: Where is the newborn king? In the east we have seen his star. And the child? what does this child say? For he is God, almighty, wise. Let us now wait his announcements. God chose Mary for his mother. Come and see your baby brother. Bring your guilt and darkness within. Come and hold him who saves from sin. Receive peace and joy without end. Come and keep your very best friend. Is a stem that goes straight on high. It points up to the heavenly sky. We put an angel or a star. Heaven comes down to us from far. Has come to save us, if we choose. Who were seeking their destiny. Who gives us life eternally. On this website I have more Christmas poems for your selection. Just click on the first link below. Christmas is such a special time for children. Many of think back to the joy we felt as children at Christmas. And this is right. For Jesus Christ came from heaven down to earth as a little child, which should touch the hearts of all mankind.